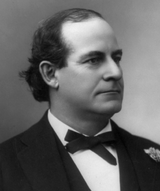 The U.S. presidential election of 1900  pitted incumbent Republican President William McKinley  against Democrat William Jennings Bryan. Their vice presidential candidates were respectively Republican Theodore Roosevelt  and Democrat Adlai E. Stevenson. 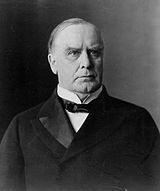 After four years in office, President McKinley’s popularity had risen because of his image as the victorious commander-in-chief of the Spanish-American War of 1898 and because of the nation’s general return to economic prosperity. The Republicans made a spirited defense of America’s interests in foreign markets. They advocated expanding ties with China, a protectorate status for the Philippines, which recently had been acquired as a result of the War, and an antitrust policy that condemned monopolies while approving the “honest cooperation of capital to meet new business conditions” in foreign markets. During the campaign Bryan repeated his 1896 call for free silver even though the recent discoveries of gold in Alaska and South Africa had inflated the world’s money supply and increased world prices. As a result, U.S. farmers were reaping greater profits and were not upset with gold as the monetary standard. The Democrats also emphasized expansionism and protectionism as well as opposition to the emergence of an American empire. McKinley campaigned from the “Front Porch” of his home in Canton, Ohio where in one day he greeted 16 delegations and 30,000 supporters. Theodore Roosevelt conducted a real “whistle-stop” campaign from the rear of a railroad train. He covered 21,000 miles, giving 673 speeches in 24 states to an estimated three million people. In the November 6, 1900, election McKinley and Roosevelt won the popular vote: 7,228,864 votes (51.6 percent) to Bryan and Stevenson’s 6,370,932 votes (45.5 percent)—a gain for the Republicans of 114,000 votes over their total in 1896. McKinley and Roosevelt received nearly twice as many electoral votes as Bryan did. 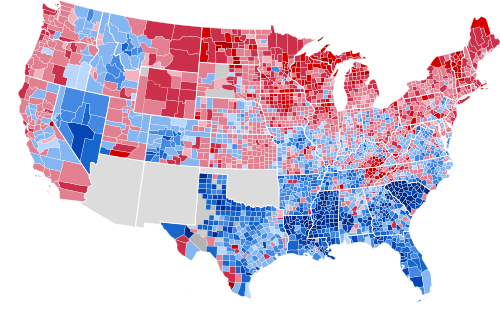 Below is a map showing the Republican states in red and the Democrats in blue. Before his first term as President (1897-1891), McKinley served in the Union Army in the Civil War (1861-1865), practiced law (1967-1877) and served in the U.S. House of Representatives (1867-1891) and as Governor of Ohio (1992-1896). At the time of the 1900 election he was 57 years old. Bryan was a Nebraska lawyer who had served in Congress (1891-1895). In addition to his 1896 and 1900 presidential campaigns, he was the Democratic presidential candidate in 1908 and was the U.S. Secretary of State (1913-1915). In 1925 he obtained additional fame or notoriety as the lawyer for the prosecution of a teacher by the name of Scopes for teaching evolution with Clarence Darrow as the defense counsel. A jury guilty verdict was reversed on appeal. Roosevelt, who then was the 42-year old Governor of New York, had been a New York State Assemblyman (1882-1884), a cowboy in North Dakota (1884-1867), a U.S. Civil Service Commissioner (1887-1895), New York City Police Commissioner (1895-1897), U.S. Assistant Secretary of the Navy (1897-1898) and Colonel in the U.S. Volunteer Calvary Regiment (“the Rough Riders”) (1898). Roosevelt did not seek or want the vice presidential nomination, but leaders of the New York State Republican Party did not like Roosevelt and wanted him out of state politics. As a result they pressured McKinley to accept Roosevelt as his new vice-presidential candidate. The latter’s great popularity among most Republican delegates led McKinley to pick him as his new running mate. Stevenson was U.S. Vice President (1893-1897) and previously a Congressman (1875-1877 and 1879-1881) and U.S. Assistant Postmaster General (1885-1889). He also was the grandfather of Adlai E. Stevenson II, who was Governor of the State of Illinois (1949-1953) and the unsuccessful Democratic presidential candidate (1952 and 1956). As a result of the War, Spain relinquished sovereignty over Cuba and ceded the Philippine Islands, Puerto Rico and Guam to the U.S. for the sum of $20 million. A subsequent post will examine some of Roosevelt’s campaign speeches.